b. 18 July 1726, o.s. of Sir George Savile, 7th Bt., M.P. Yorks. 1728-34, by Mary, da. of John Pratt of Dublin. educ. Queens’, Camb. 1745, unm. suc. fa. 16 Sept. 1743. Sir George Savile was the last male representative of an old and distinguished Yorkshire family, with a parliamentary ancestry dating back to the 16th century. With estates in Nottinghamshire and Yorkshire, as well as in Ireland, they were a power in both counties; but first and foremost regarded themselves as a Yorkshire family. In the 17th century they produced a statesman—the 1st Marquess of Halifax, the great ‘Trimmer’. Sir George Savile was hardly less worthy of note: upright, disinterested, independent, ‘a pattern of excellence in a British senator’.1 For most of his political life he was closely connected with Lord Rockingham, yet was never accused of faction or subserviency to aristocratic patronage. He was a Whig who never wished for office and never belonged to a party, and who valued the approbation of his constituents as his sole reward. In 1753 Savile, strongly backed by Rockingham, stood as a candidate for Yorkshire at the forthcoming general election. 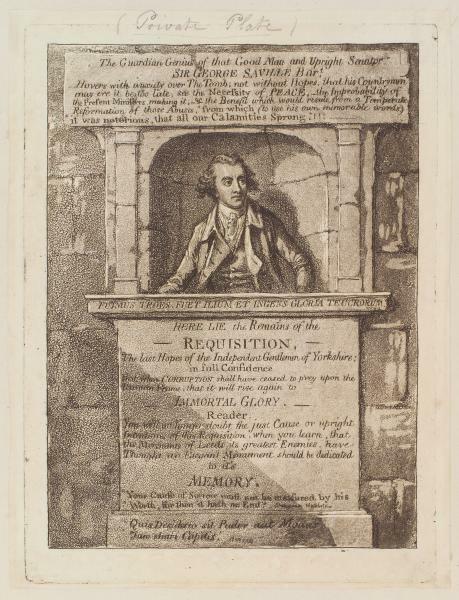 ‘I look on my behaviour on the present occasion as what must in great measure fix my character for life’, he wrote to Rockingham.2 ‘It is his favourite point’, wrote John Yorke to his brother Philip on 30 Aug. 1753,3 ‘and he spares no pains to compass it.’ Savile withdrew rather than disturb ‘the peace of the county’; refused invitations from Rockingham to stand for York in 1754 and 1758; and in 1759 was returned for Yorkshire unopposed. He won the support both of the Tory country gentlemen and the Dissenters, and throughout his career in Parliament was as secure in the county as if he had sat for a close borough. In addition, his influence was decisive in the choice of the second Member. Savile spoke frequently, and soon became one of the most respected men in the Commons. In 1761, when he had not been two years in the House, Newcastle thought of him for Speaker.4 Pitt, when invited to form an Administration in August 1763, wished for his assistance in London.5 Though prominent in the opposition to Bute and Grenville, he tried to judge questions on their merits, with a mind subtle and acute. ‘Though his reason was sharp, his soul was candid’, wrote Walpole,6‘having none of the acrimony or vengeance of party; thence he was of greater credit than service to that in which he listed.’ James Harris, a political opponent, described one of Savile’s speeches on general warrants as ‘refining till what he said was incomprehensible’;7 yet did not doubt his honesty and integrity. Savile refused to take office in the Rockingham Administration,8 and kept aloof from party conclaves. He helped to procure addresses from the trading towns of Yorkshire in favour of the repeal of the Stamp Act; and wrote a paper (22 Feb. 1766)9 ‘recommending a suitable behaviour to the Americans on that occasion’. They should not ‘affect to seize the yielding of Parliament as a point gained over parliamentary authority’. You must be sensible [he wrote, addressing the colonists] what friends you have in the present ministry ... You should know that the great obstacle in their way has been ... the intemperate proceedings of various ranks of people on your side of the water ... If, therefore, you would make the proper return to your country ... hasten to express your filial duty and gratitude. In a letter to Thomas Moffatt, a physician of Rhode Island, probably written after the Boston riots of 1768,10 he expressed his resentment against the ‘infatuated’ Americans. I am determined that my conduct in Parliament shall show forth that I am for measures of moderation and lenity, founded in vigour, without a spark of passion or resentment. I am afraid these same colonists are above our hands, and I am almost ready to think that George Grenville’s Act only brought on a crisis twenty or possibly fifty years sooner than was necessary. This indeed is, regarding colonies, almost all the ill that can be done, for in my opinion ... it is in the nature of things that some time or other colonies so situated must assume to themselves the rights of nature and resist those of law. Savile saw with regret the Rockingham party go into opposition against the Chatham Administration. I am sure I sincerely wish the set I wish the best to, to do nothing. If injustice is attempted against the East India Co. oppose it, protest against it. If so good a bargain is not made as should be, show weak parts ... It is a reasonable thing for me to ask, and yet perhaps an unreasonable thing to expect to obtain from men in some of your situations that you will forget where propositions come from. In the late 60’s two questions especially stirred his interest, and brought him to the front of the political stage: the nullum tempus bill and the Middlesex election. About his introduction of nullum tempus, Rockingham wrote to Newcastle on 7 Feb. 1768:16 ‘His diffidence of his own abilities and the uncertain state of his health made him for a long time positive that he could not undertake to be the mover, though every sensation of his mind made him anxious to do his utmost on the matter.’ It was a measure which cut across parties, and rectified an old grievance of the landowning class. ‘I hold a leasehold under my constituents’, Savile once told the House of Commons.17 ‘I have only borrowed dignity.’ He saw the Middlesex election as an attack on the right of the electors freely to choose their representatives, and it moved him to an anger he rarely felt. ‘I look on this House as sitting illegally after their illegal act’, he said in the Commons on 10 Jan. 1770.18 ‘They have betrayed their trust.’ In 1771, and each subsequent year until Wilkes took his seat in the House of Commons, he introduced a bill for securing the rights of electors. ‘Sir George Savile has the best right of any man in your House to act John Hampden’, wrote Charles O’Hara to Edmund Burke on 4 Nov. 1769. I distinguish between the Church of God and Christ and the Church of England, and whenever the Church of England differs from the Church of Christ I give the preference to the latter. The point in question is whether we shall lay aside subscription to the Articles and adopt the Scriptures in their room. The Scriptures are the only rule of the Church of Christ, and adhering to the Scriptures in opposition to human inventions and corruptions is the first principle of Protestantism. On 14 Feb. 1778 he introduced a bill for the relief of Roman Catholics. ‘He thought Papists ought to have security in the enjoyment of their properties’, he said on 19 June 1780,20 but should not be allowed to proselytize; and he moved for a bill to restrain them from teaching Protestant children. He looked on their trade as destructive, either from bringing in too great an increase of money, which would overturn the liberty of this country, or from many of the importations, tea especially, being destructive of the healths of the people of England. He also protested against the territorial acquisitions as public robberies. I could wish your Lordship would converse with Sir George Savile on these subjects. We know his motives for staying away ... but still to the majority his absence will seem a condemnation of our conduct, and of what weight that apparent tacit condemnation is everyone may discern who knows how much of the strength of our cause has arisen from its having his support. I have an absolute horror of the approach of York races lest anything should tempt you either to make any declaration or indeed to let such an idea generally transpire. I earnestly wish that you would let us all meet again in London before you take any step of such general importance ... I am indeed doubly interested in this, for assuredly if you give up the county, and I must add the public, I have nothing further to do but fairly to retire and relinquish all late ideas relative to Yorkshire, or of being of any service to the public. I am very much in the same persuasion I was before ... but ... I am obliged to own that being the cause of a contest and all its disagreeable consequences in the county of York is a mischief I could not easily forgive myself having contributed to ... I have laid in my claim however with my friends that they may not too much depend on my standing the whole seven years work. When the American problem came to the crisis of 1774, Savile’s views had changed. He no longer saw the colonies as naughty children, and the British Government as an indulgent parent. He was reserved towards North’s punitive measures; said ‘he had trembled at every step that had been taken on the affair of Boston’, and ‘protested against the violence of condemning the Americans without hearing them’.24 Possibly he was influenced by his friend, David Hartley, for whom the Americans could do no wrong and the British Government no right. On 10 Feb. 1775 Savile described American resistance as ‘justifiable rebellion’. On 4 Dec. 1777 he ‘was not for treating with America as an independent state’; yet on 28 May 1778 seconded Hartley’s conciliatory proposals, which would have acknowledged American independence.25 Twice (18 May 1775 and 14 Apr. 1778) he moved the repeal of the Quebec Act as ‘odious and inimical to the Americans’. To the increase of county Members he did not particularly object, it might be a good measure. As to triennial Parliaments, they were the people’s right, and if he knew ... that the majority of his constituents were for them, by that he should think himself obliged to promote triennial Parliaments; as to himself ... he had not formed an opinion about them. I venture to submit it thus publicly to you without the opportunity of communicating it to those whose principles, judgment, and line of conduct in the public walk I have been habituated to look up to with high respect and esteem. While willing to make a motion for parliamentary reform, Savile recognized that it was ‘not yet either universally or warmly and decisively supported’.31 More prominent in his speeches during the last year of North’s Administration were his attacks on the loan of 1780. During the last two years of Rockingham’s life relations between him and Savile became less close. Rockingham was alarmed at the way the Association had taken the lead in Yorkshire politics, disliked Savile’s encouragement of its activities, and disagreed with him on parliamentary reform. 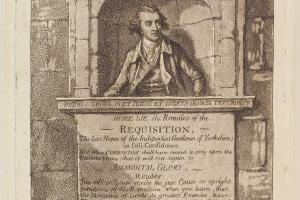 On the formation of the Rockingham ministry there is said to have been ‘some coolness’ between them because of Rockingham’s failure to provide for Hartley, whom he disliked.32 On 7 May 1782, on the younger Pitt’s motion on parliamentary reform, Savile took a stronger line than ever before. He ‘declared that it was his opinion that the House might as well call itself the representative of France as of the people of England’. He warmly advocated the recognition of American independence, and when Shelburne became minister voiced his suspicions of his policy in that respect.33 He did not vote in the division on Shelburne’s peace preliminaries, 18 Feb. 1783, and was classed by Robinson in March 1783 among the ‘country gentlemen and persons unconnected’. Although I grant that nothing in this world is to be done by solitary efforts, and that therefore if a man will not be content with being a well-meaning non-effective, he must not be sentimentally nice about his accomplices, yet there is reason and measure in this as in all other things of the world ... to unite as allies generally with men one ought to impeach, to act with a man who has done more mischief in a given time than one would have thought could have been well contrived ... can be justified one way (if it can at all) viz. the lesser of two evils—Lord Shelburne is worse ... You must know I took great offence at Charles Fox’s expression of ‘Amicitiae sempiternae, inimicitiae breves—you know I always opposed him (Lord North) on the American war; that is over, so I bear no malice.’35 ... Charles Fox’s own natural moral sense would have made him not hazard such an expression I am sure, but that all (even pretence of) public feeling is laid aside, and it is so habitually understood and felt that all save private feeling are a sham. He was proceeding to speak in favour of the motion, when, finding himself too weak to speak with that animation that he wished to express, he sat down to the great mortification of the House, who were distressed to see so good a man in so weak a state of health. It was his last speech in the House. Though Fitzwilliam had private reasons for wishing Savile to remain, he was also expressing the general sense of the county. But Savile knew that the game was nearly over. He died, shortly after leaving Parliament, on 10 Jan. 1784. 1. Oldfield, Rep. Hist. (1816), v. 267. 3. Add. 35374, f. 99. 4. Bedford mss 44, f. 194. 6. Mems. Geo. III, i. 279. 7. Harris’s ‘Debates’, 17 Nov. 1763. 8. Walpole, Mems. Geo. III, ii. 137. 10. Grenville Pprs, iv. 510-12. The whereabouts of the original ms has not been discovered. 11. Albemarle, Rockingham Mems. ii. 75-76. 16. Add. 32988, ff. 204-6. 17. Brickdale’s ‘Debates’, 7 Feb. 1771. 18. Walpole, Mems. Geo. III, iv. 26. 19. Parl. Hist. xvii. 289-93. 21. Parl. Hist. xvii. 464. 24. Walpole, Last Jnls. i. 334, 343. 25. Almon, i. 176; viii. 129; Stockdale, viii. 344. 26. Letters Theophilus Lindsey , ed. McLachlan. 84. 27. Wyvill, Political Pprs. i. 32. 29. Wyvill, i. 153-5; iii. 208-13. 32. Rich. Burke sen. to Rockingham, 14 Apr. 1782. 33. Debrett, vii. 133, 281-2. 34. Rich. Warner, Lit. Recollections, ii. 242-6. 35. The reference is to Fox’s speech on Shelburne’s peace preliminaries, 17 Feb. 1783. 37. Fitzwilliam to Portland, 25 Nov. 1783, Portland mss.